Astoria has numerous 4 by 4 foot panels of 100 count prism glass in its downtown sidewalks. However, many of these large panels have missing or filled in glass prisms. Studio 11 has produced their prism glass to help reverse the lose of these prisms. Although not meant to replace all the glass in each panel, Studio 11 hopes that it can replace some of the missing or filled in glass. Studio 11 has designed and created its glass, not as perfectly historically accurate reproductions, but more as glass that will look close to an original prism in shape and color. This month Studio 11 has been able to install their first 14 glass prisms in the Astoria downtown at the corner of 12th and Commercial. Hopefully this first installation will be the beginning of a project to stem the disappearance of this interesting and colorful feature of the sidewalks of downtown Astoria. 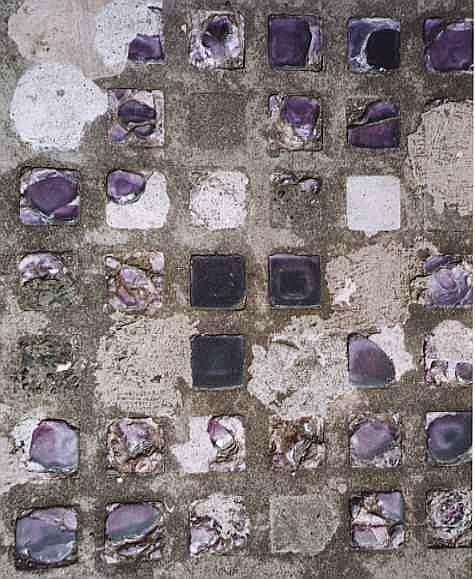 Background: Vault Lights, also known as Sidewalk Lights (or Pavement Lights in the UK), are those old glass prisms set into sidewalks to let light into vaults and basements below. Prisms were used instead of flat glass to disperse the light, diffusing it over a large area; plain flat glass would simply form a bright spot on the floor below, not providing much useful general lighting. The idea originated in the 1840s as deck lights. They were used on ships to let light below-decks, especially when an open flame would be hazardous, such as on colliers. Functional deck lights are still made today, but few of the originals remain. One surviving specimen from the whaler Charles W. Morgan has been much reproduced. The idea caught on; by the late 19th century they were common in the larger downtowns, especially New York. Their use declined as electric light became cheaper and better, and by the 1930s were on their way out. Now, they are endangered relics. After 100 years of sidewalk traffic, they usually look like this, with most of the glass broken out then filled in, most of the rest smashed but still in place, and a few brave soldiers holding the fort. Company identification (usually in the form of brass plaques) is often set into the concrete for free advertising. It's difficult to tell though whether the company advertised made just the glass, or the entire glass, steel and concrete structure.